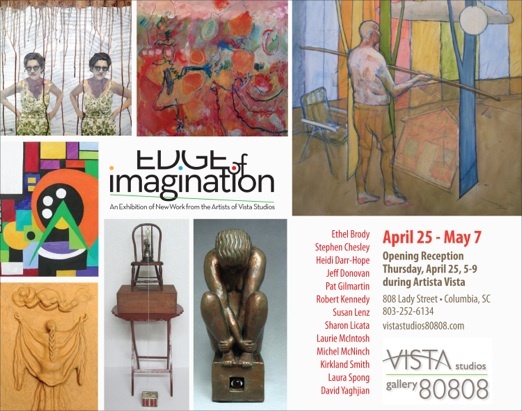 Edge of Imagination is presented by the 13 resident artists of Vista Studios, April 25-May 8th with the opening reception on Thursday, April 25th from 5-9pm. This event provides a unique opportunity to visit with the artists in their studios as well as view their new collection of work. The participating artists are Ethel Brody, Stephen Chesley, Heidi Darr-Hope, Jeff Donovan, Pat Gilmartin, Robert Kennedy, Susan Lenz, Sharon Licata, Laurie McIntosh, Michel McNinch, Kirkland Smith, Laura Spong, and David Yaghijan. The opening reception of Edge of Imagination is in conjunction with the Annual Artista Vista Gallery Crawl. The Show will run through Tuesday, May 8th. Gallery hours are weekdays 11am-3pm and weekends 1-4pm, or by appointment. Please call Gallery 80808 at (803)252-6143 to confirm hours. Their website is www.VistaStudios80808.com.